Being an island, Sri Lanka is a haven for beach lovers and is known for being home to some of the most pristine beach stretches in the region. The best beaches in Sri Lanka are considered to be specifically in the southern and eastern parts of the country – with each beach having something unique to offer every type of traveller. The beautiful and sunny southern region is a popular destination amongst tourists and locals alike and is visited throughout the year. Listed below are some of the best beaches in the southern province of Sri Lanka that you should visit on your next beach vacation. Although quite small, the scenic Koggala beach is a hidden beach stretch that is less-often frequented. 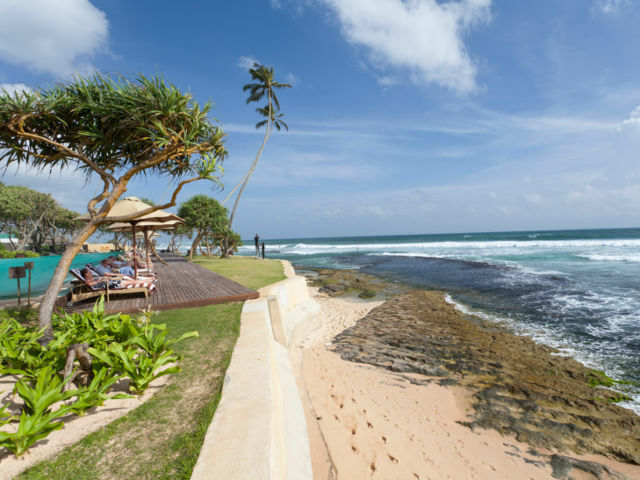 The beach is ideal for travellers who wish to escape to its tranquil atmosphere and quietude – away from the crowds that are usually associated with some of the larger beaches in Sri Lanka’s southern province. It is also home to an abundance of marine life – marine turtles in particular – making it a great spot to observe these endangered species in their natural habitat. Tangalle is another scenic area for beaches, with miles of coastline dotted with shady palm trees and beautiful sandy shores. The town itself is a prominent fishing port of the country and is located at one of the largest bays of the country. Being popular amongst tourists, Tangalle offers a number of attractions that can be visited – the Kalametiya Bird Sanctuary, the Hummanaya blowhole and the Parewella Natural Swimming Area – all of which are in relatively close proximity to the town and are worth a visit. With its name itself translating to “sandy village”, Weligama is another beautiful beach stretch in Sri Lanka’s southern province. It is a unique combination of a vibrant fishing town and beach destination and a popular tourist attraction. A signature sight of Weligama are its stilt-fishermen – who perch upon poles out in the sea to catch fish – a unique style of fishing that is believed to have originated in southern Sri Lanka. It is also home to a few attractions that you may want to visit, including local lace-making stalls and a snake farm located a short distance away. This beach is one of the most popular tourist attractions along the country’s southern coast. Unawatuna’s beaches are dainty and picture-perfect – famed for its beautiful corals and the scenic views that it has to offer. Since it is one of the more touristy beaches, you can expect to find a myriad of budget-friendly dining and accommodation options with ease. However, Unawatuna is also rich in biodiversity, home to many species of endemic birds and marine life. The little town of Hikkaduwa is a popular surfing spot, being considered the second-best beach for surfing in Sri Lanka. This well-developed surf tourist town was once a fishing village but later expanded as its popularity as a beach destination grew. It is also home to the Hikkaduwa Coral Sanctuary a few miles off-shore – home to numerous varieties of stunning multi-coloured corals. Snorkelling opportunities will be plentiful as well. Mirissa has a lot to offer. It is primarily renowned for being an excellent beach for whale watching in Sri Lanka – giving visitors plenty of opportunities to spot these magnificent sea mammals out in the open ocean. In addition to whale watching, Mirissa is also a popular surfing beach and is a great spot to head to with your surfboard to catch a wave. The Hanbantota Beach is idyllic and its picturesque views have captured the hearts of many over the years. It is a great beach to visit for snorkelling and diving opportunities. Hambantota is also a historic town, with its roots dating back to as 200 BC. Sri Lanka’s southern coast is home to many more serene and beautiful beaches in addition those mentioned above. Finding accommodation and places to eat will be a breeze, given their popularity as tourist destinations. Each beach is a promise of glorious views, delightful scenery and a truly relaxing atmosphere – ideal for your next beach vacation. Fortress Resort & Spa Koggala, Galle, Sri Lanka.